Action Garage Door carries several high-quality commercial garage doors for businesses throughout the DFW Metroplex and beyond. When your business needs a new commercial garage door, we can help you select the right one based on your needs and design preferences. Our commercial garage doors include roll-up styles made of durable steel, and we can also design custom garage doors for your building. Our garage door experts will install your commercial garage door for you with minimal disturbance to your business. We will also ensure that your new door works safely and properly, so you’ll enjoy peace of mind. Garage doors are just as important to the appearance and security of a business as they are to a residence. To meet all your company’s garage door needs, Action Garage Door offers a selection of dependable steel roll up garage doors for commercial use. 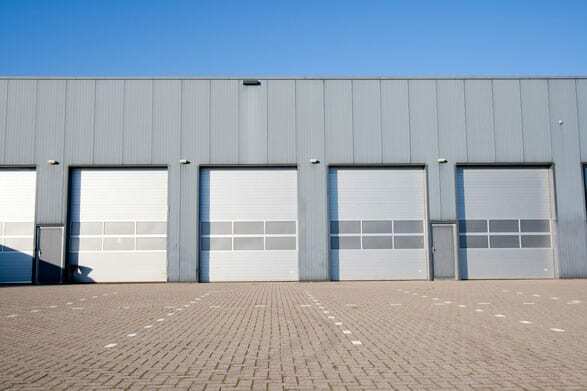 Whether a commercial garage door is needed in your Dallas, Fort Worth, Austin, Houston or San Antonio storage facility, warehouse, business or dock, these high-quality roll up garage doors will provide years of worry-free operation. Highly regarded manufacturer Amarr now offers three door models to meet a wide variety of commercial needs. All commercial garage door models feature 26-gauge steel and polypropylene wear strips. Perfect for most storage facilities, the Model 5501 roll up garage door offers excellent performance and reliability at an economical price. It features 21 different colors and an extruded aluminum bottom bar with a structural steel angle for maximum strength. The Amarr 26-gauge galvanized steel curtain features dual lock assembly. Heavy-duty galvanized steel guides are hot-dipped for strength and rust resistance. The model 5501 comes in sizes starting as small as three feet wide. Engineered for high cycle applications, the Model 5601 is an excellent choice for most docks or warehouses. It is available in 21 colors and features durable fixtures including dual galvanized steel slide bolt locks, a heavy-duty door bracket, steel bearing shaft support, and a 12-inch drum assembly. Manufactured by Amarr to withstand wind speeds up to 130 mph, the Model 5652 is the perfect choice for storm-prone areas such as those surrounding Dallas / Fort Worth, Austin, Houston and San Antonio. The Model 5652’s UHMW nylon wind locks provide maximum protection without sacrificing ease of operation. This model is available in 21 colors. It comes with dual galvanized steel slide locks and heavy-duty galvanized steel guides. All Amarr sectional roll up garage doors are made of roll-formed steel that has been hot-dip galvanized to reduce rust, then pre-painted with a primer and tough polyester top coat. Amarr commercial doors feature tongue-and-groove construction to provide a tight fit between the sections. In addition, a bottom rubber seal helps reduce infiltration of dust, dirt, and drafts. A wide variety of widths and heights to suit most commercial garage door openings are available. 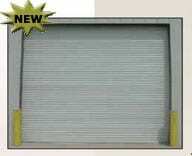 This is a heavy-duty two-inch insulated steel door with a durable outer steel skin to resist dents. It comes with a 10-year limited warranty. Manufactured by Amarr, is a medium-duty insulated steel door. It is 1-3/8 inches thick and provides an R-value of 6.58 with a 10-year limited warranty. This is a CFC-free polyurethane sandwich door that measures two inches thick for an insulation R-value of 15.67. This Amarr model also comes with a 10-year limited warranty. These models are the manufacturer’s “workhorse” open-back steel garage doors. Available in a variety of steel gauges with tongue-and-groove design and a bottom weather seal, these doors can be modified with insulation to fit any application. This is an aluminum garage door by Amarr, constructed with two-inch extruded aluminum rails and stiles. The model can be fitted with solid aluminum panels or full-view glass. Tracks come in two-inch or three-inch standard lift, high lift, or vertical lift with low headroom, and all follow the roof pitch styles. Custom track configurations are available. Action Garage Door Repair Specialists Are Ready to Earn Your Business! Whether you are looking for help to understand Amarr’s commercial garage door installation process or need assistance choosing a garage door that best fits your needs, Action Garage Door is your number one source of garage door expertise.